The second leg of an ambitious cultural exchange scheme will see a group of young people from Coventry staging an installation on the experience of Irish emigrants in Coláiste Choilm, Ballincollig, this Monday (25th March). 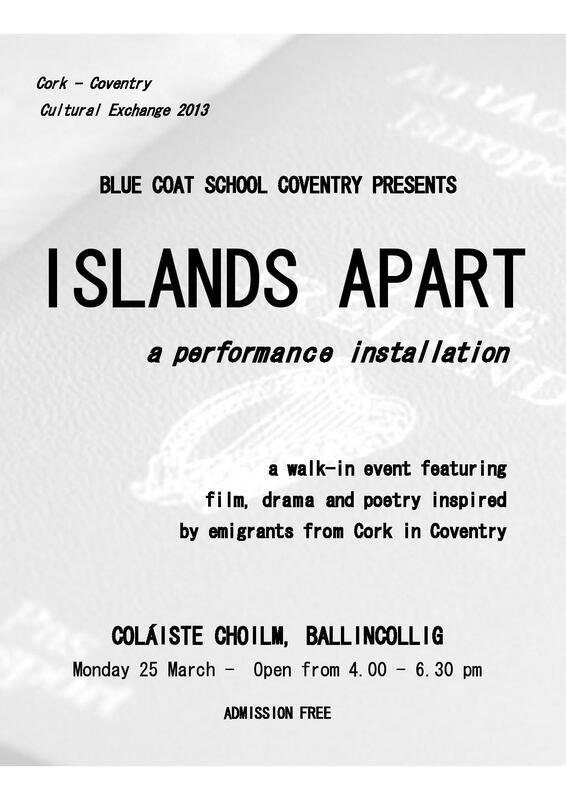 Islands Apart is a performance installation – a mix of film, music, poetry and drama – which focuses on the experiences of the many thousands of people from Cork who emigrated to Coventry in the UK over the last 50 years. The exchange began in February when 18 pupils from Coláiste Choilm travelled to Coventry to stage a production of Tom Murphy’s ‘Whistle in the Dark’. Now, the friends they made in Coventry are heading back to Ballincollig to make their own contribution to a better understanding of what emigration between England and Ireland means. The performance installation will take place in the Prayer Room at Coláiste Choilm from 4-6:30 on Monday. It’s a free, walk-in event, and visitors will have the chance to listen to poetry, watch short mini-dramas, and enjoy filmed reflections of emigrants’ experiences. The Coventry students have spent a huge amount of time time interviewing Irish emigrants in Coventry, with the support of Julie Boden and Gary Davies – teachers at Blue Coat school in Coventry – as well as Irish community groups in Coventry.